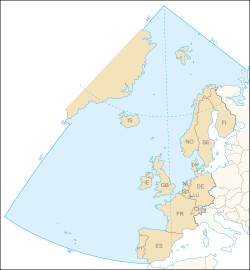 The Convention for the Protection of the Marine Environment of the North-East Atlantic or OSPAR Convention is the current legislative instrument regulating international cooperation on environmental protection in the North-East Atlantic. It combines and up-dates the 1972 Oslo Convention on dumping waste at sea and the 1974 Paris Convention on land-based sources of marine pollution. Work carried out under the convention is managed by the OSPAR Commission, which is made up of representatives of the Governments of the 15 signatory nations, and representatives of the European Commission, representing the European Union. The OSPAR Convention was concluded at Paris on 22 September 1992. The Convention for the Protection of the Marine Environment of the North-East Atlantic was opened for signature at the Ministerial Meeting of the Oslo and Paris Commissions in Paris on 22 September, 1992. The Convention has been signed and ratified by all of the Contracting Parties to the original Oslo or Paris Conventions (Belgium, Denmark, the European Community, Finland, France, Germany, Iceland, Ireland, the Netherlands, Norway, Portugal, Spain, Sweden and the United Kingdom of Great Britain and Northern Ireland) and by Luxembourg and Switzerland. The OSPAR Convention entered into force on 25 March, 1998, and replaced the Oslo and Paris Conventions, but decisions and other agreements adopted under those conventions remained applicable unless they are terminated by new measures adopted under the OSPAR Convention. The first Ministerial Meeting of the OSPAR Commission at Sintra, Portugal, in 1998 adopted Annex V to the Convention, extending the cooperation of the signatory parties to cover "all human activities that might adversely affect the marine environment of the North East Atlantic". Nevertheless, programmes and measures cannot be adopted under the Convention on questions relating to fisheries management, which are currently coordinated by European nations in the north east Atlantic and North Sea by the International Council for the Exploration of the Sea (ICES). The OSPAR convention now regulates European standards on marine biodiversity, eutrophication, the release of hazardous and radioactive substances into the seas, the offshore oil and gas industry and baseline monitoring of environmental conditions. In 2000, the OSPAR Commission published a comprehensive report on the quality of the marine environment of the North-East Atlantic. This was supported by five smaller reports on the different parts of the OSPAR maritime area –the Arctic, the Greater North Sea, the Celtic Seas, the Bay of Biscay/Golfe de Gascogne and Iberian waters, and the Wider Atlantic. ↑ Finland is not on the western coasts of Europe, but some of its rivers flow to the Barents Sea, and historically it was involved in the efforts to control the dumping of hazardous waste in the Atlantic and the North Sea. 1 2 Luxembourg and Switzerland are Contracting Parties due to their location within the catchments of the River Rhine.